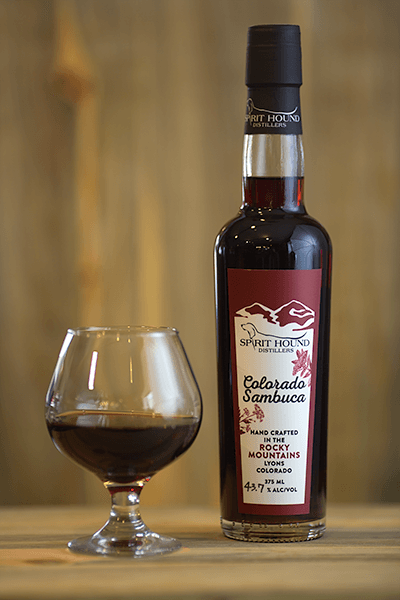 The latest addition to the Spirit Hound line up is our very own small-batch, hand-crafted Colorado Sambuca. We call it "Colorado Sambuca" as a nod to the origin of the name of our state - meaning "colored red" in Spanish and originally named after the red sandstone found throughout the region. Traditionally an Italian anise-flavored liqueur, it may be “white”, “red”, or “black (deep blue)” in color. Our sambuca is quite red - or rather, a beautiful burgundy hue. Our sambuca is infused with an enormous amount of wild-grown Elderberries. The addition of whole organic Anise stars imbues our version of this classic liqueur the wonderful licorice character one would expect from a world-class sambuca. We have spared no expense on the finest botanicals used at their optimum quantity to create a truly exceptional product. Bottled at around 90 proof, our sambuca makes a fine digestif, perfect after a satisfying meal.